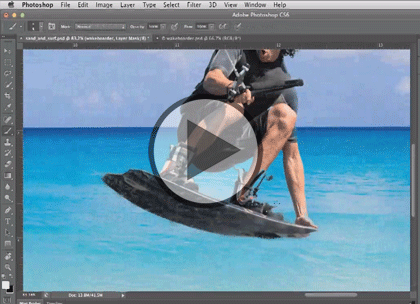 Master Photoshop CS6 on your terms with this 12 part learning series. Photoshop is the industry-leading image-editing program for digital photographers, graphic designers, web developers, and other creative professionals, and Photoshop CS6 is loaded with great tools to manage and enhance your images. Now, you can learn the ins and outs of maximizing Photoshop CS6 – from basic image editing to taking advantage of Camera RAW – with Photoshop CS6 Essentials. Work with selections, layers, filters, and masks. Correct color and fine-tune image quality for professional results. Utilize painting and retouching methods. Create images for the web, print, video, and more. Take advantage of Adobe Bridge and the Camera RAW format. This course assumes some familiarity with Adobe Photoshop CS6. This course is part of a 12 part learning series. The series is made up of the following courses; Photoshop CS6: Images and Workspace; Photoshop CS6: Bridge, Metadata and Files; Photoshop CS6: Layout and Tools; Photoshop CS6: Mask, Pin and Retouching; Photoshop CS6: Brush Tool and Touchup; Photoshop CS6: Histogram, Red Eye and Raw; Photoshop CS6: Layers; Photoshop CS6: Fill and Smart; Photoshop CS6: Smart Filters, Size and Text; Photoshop CS6: Slices and HTML; Photoshop CS6: Animation and 3D Objects; and Photoshop CS6: 3D Animation and Features. Please watch the courses in the order listed if you are new to the material.